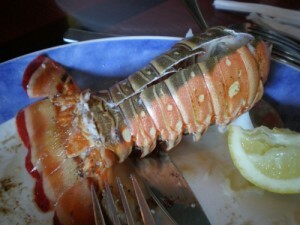 If you are wondering how to cook lobster tail then you are in luck as lobster tail is a very easy-to-make, refined meal. One of the easiest and yet tastiest meals is the broiled lobster tail. To cook the lobster, begin by preheating your broiler to a standard temperature. Next, cut the top side of the lobster shells lengthwise. Pull shell slightly apart, and now we will need to season the meat. The meat doesn’t need much seasoning considering it is already very flavorful but we will still want to add equal amounts of butter, paprika, salt, and pepper to give it that extra flavor. Finally, place the lobster tails in the broiler for five to ten minutes. The lobster tails should be lightly browned and the meat opaque. Use the lemon wedges to garnish the lobster tail and add that last bit of flavor. If you really want to accentuate the taste of broiled lobster, pair it with a Chardonnay. Preferably one that is lighter and contains more fruity flavors of your choosing.